The members of this diminutive race are a sight to behold. From a distance, a halfling could be mistaken for a well-dressed child, but up close it is easy to differentiate these small-framed men and women from the children of the taller races. These beings look like small sculptures of slim and athletic humans. Smooth features on a petite but fully developed body give adult halflings an attractive, graceful appearance. 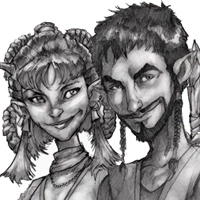 Their bodies are proportionate if little, and it is very rare to see roughened or weathered features on a halfling, either male or female. Female halflings are both slightly taller and somewhat slimmer than their male counterparts. While many allow their hair to grow long, it is rare to see any but the children sporting it flowing freely. Once a female is considered an adult woman, it is far more common for her to keep her hair bound in braids. In most families, the age of the woman will determine the number of braids she wears. The style of braiding differs from clan to clan, but many choose patterns that border on a unique art form, though comfort is also taken into consideration. Practicality is important to the halfling race, and can be observed even in the methods the women use to braid their hair. Thus, it is not uncommon to find tiny, multi-functional objects hidden within the braids, or even used to hold them together. Most halfling women have little reason to manufacture allure, as their innate grace is apparent in every movement they make. From a simple, confident walk to a curvy silhouette, halfling women excel at projecting a natural, unpretentious sensuality. Many are also drawn to the sense of mystery and worldliness that some halfling women give off. Even amidst chatter and gossip, a wink and a fleeting smile can hint that they can talk much while still saying little of what they know. unlike the sideburns these are never grown to an exorbitant length. While some halfling women admit a certain fondness for those rare but remarkable braided sideburns, far more would tell you that when choosing a man, be it as a husband, a friend or a father, you should look to the eyes. Many halfling males seem to have eyes that can speak of their fine character; the sincerity and honesty presented in them is only occasionally belied by the glimmer of mischief or humor. Even so, while it is rare to glimpse a halfling sporting a look that is outright malicious, those sparkling eyes and a playful grin can also hide more than they give away. As a race, those of halfling-kind share one common experience when it comes to how they are perceived by outsiders: almost all are underestimated in everything they do. Taller folk should keep in mind that what appears to be innocence in a set of wide eyes may as easily be cunning, and the gently upturned ears of a halfling, while very cute, may often eavesdrop on a conversation from a greater distance than expected. Furthermore, swinging hands with nimble fingers are notably prone to mischief, and the often elaborate braids of adult women or the many pockets of men may hide small trinkets or tools used for such impish misdeeds.